Age of Mythology has laser-crocodiles. There’s a lot of other great things about it, and we’re happy to tell you about it on Three Moves Ahead this week, where Troy Goodfellow and J.P. Grant joined me to talk about why Age of Mythology is one of the best RTS games ever made. But laser-crocodiles seem like a good place to start. Not many games can boast them. Three Moves Ahead is a weekly strategy podcast I host on the Idle Thumbs Network, where knowledgeable strategy gamers and designers gather to talk about our favorite genres, and since Tim has been foolish enough to entrust me with posting privileges on the site while he is asleep and powerless to stop me, I thought I’d keep you all apprised of what we’re up to on the show. This week’s is one of my favorites, because there’s so much to say about Age of Mythology. How it uses its mythological theme to be more nuanced and interesting than any of the more conventional Age games. The way you tech up, the choices you make along the way, and why the deepen the game tremendously. We also talk about the tragedy of Ensemble, and how they never made another game like this and were eventually shut down by Microsoft. 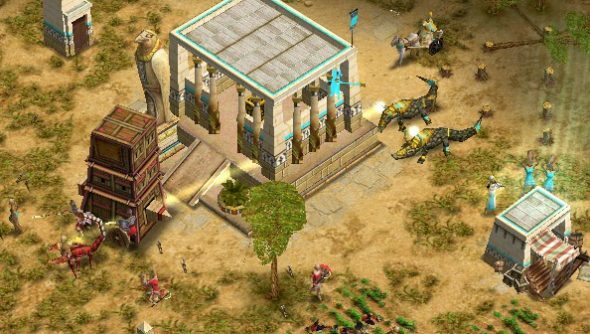 Worse yet, Age of Mythology remains unavailable in the digital marketplace. If you want to play it, you’ve got to go dig up a physical copy, and as I discovered the other day, some vendors will send you a copy without a CD key. Still, if you can overcome this abominable situation, you’ll be rewarded by an RTS of rare quality. Listen to this week’s show to find out why!